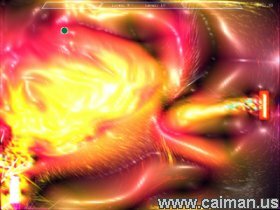 Caiman free games: Plasma Pong by Steve Taylor. I promise you that this is the most original and probably the best Pong-game you have ever played. `How to turn this simple game into something different than the rest?`, you might ask. Well, add plasma to it and you have an entirely different way of playing. You take control over a paddle, but the paddle is more than just a paddle. It can squirt plasma to send the ball to your opponent and the opponent's attempt to do so as well, makes the ball float all around, making it more difficult to catch it. 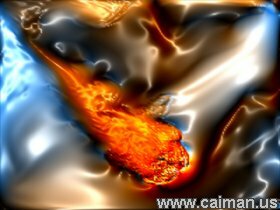 Another special move that is at your disposal, is attracting the ball to make it explode with some extremely sweet graphical eye-candy. The graphics are spectacular and the colours (which can be changed with the keypad) will make it hard to focus on the game because it is amazingly beautiful. An off-line multiplayer mode has been built in the game so that you can play this marvellous game with one keyboard together with a friend. As a pleasant extra, there is a `Sandbox`-mode where you can play around with the plasma in different colours, modes, etcetera.